3 Reel, 5 Payline classic online video slot by Real Time Gaming. 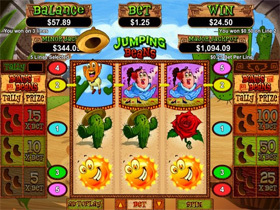 This is a fun Mexican themed game with stunning new features and colorful characters. As kids it was always fascinating to watch little Mexican jumping beans jump about as they got heated, now players can be entertained by these energetic little beans just as before! Mr. Bean substitutes for all symbols besides the Scatter Mrs. Bean. The Wild doubles payouts when substituting in winning combinations. When 3 Mrs. Beans appear anywhere 10 Free Spins will be awarded. Should Mr Bean, Mrs Bean or the Bandido Beans appear during the Free Spins, they will be counted at the end of the free spin feature and a Bonus Prize will be awarded. Jumping Beans must be played with all five lines enabled. Bet from 5 cents per spin up to $25 per spin. After any normal spin, should Mr or Mrs Bean appear above or below the screen, it will automatically be nudged back into the reel area which allows for more chances of winning! The Bonus Beans tally has 6 Levels. 3, 4 or 5 Beans - 1st level - awarded 5x the triggering bet. 6, 7 or 8 Beans - 2nd level - awarded 10x the triggering bet. 9, 10 or 11 Beans - 3rd level - awarded 15x the triggering bet. 12, 13 or 14 Beans - 4th level - awarded 25x times the triggering bet. 15, 16 or 17 Beans - 5th level - awarded 50x the triggering bet. 18 Beans - 6th level - awarded 100x the triggering bet. The Free Spins feature will only re-trigger once. 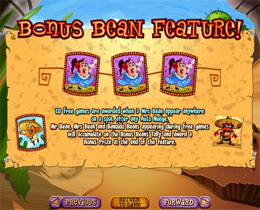 5 Free Spins will be added and Beans will continue to accumulate. A fun and entertaining game for the whole family!